When asked last year by John Scalzi if, given the power to travel anywhere, I would venture to a new country or visit an old friend, I didn’t hesitate. I chose visiting friends. When a fellow author asked me what my most memorable meal was, I talked about the neighborhood potlucks my friends throw each year. Friendship, in short, is vital to me. I go out of my way to stay connected with my friends. Not just friends, but warrior-wizard-friends. These three meet on the way to Hogwards and grow and fight side by side. They see each others’ strengths and weaknesses, and remain friends throughout the worst of times, and the best. The argument that sisters can’t be friends, or that sisters are only friends because they must be, is a wobbly one. These sisters from two classics are not always friends, but they stand by each other. Their relationships and alliances, successes and failures, add strength to their friendships even when it first seems it will break them apart. A boy and his stuffed tiger - best of friends, no matter the weather, parental injunctions to stop-that-racket, or Suzi. I love these two unequivocally, and if one isn’t really real, well so be it, I get that Cartoon Boys are a construct, but Hobbes and I will be over here waiting until Calvin gets home from school just the same. So much has been written about Frodo Baggins and Samwise Gamgee that it’s hard to add to it. The friendship bond between the two hobbits, nevermind the fact that Sam is awesome, is one of the great fantasy friendships. Told in notes, memories, and letters this wrenching story of female friendship during World War II is filled with adventure and daring. Kittyhawk’s interpretation of events and what Verity is willing and able to reveal are part of the intensity of this book, but it’s the vignettes when their lives are nearly normal when we see them true: friends who’ll care about each other until the end. In Updraft, my debut fantasy novel from Tor, there are a number of different kinds of friendships - between the main character, Kirit and her best friend, Nat; between Ezarit the trader and her close friend Elna… the kinds of friendships forged in the Spire, and more. What are your favorite friendships? 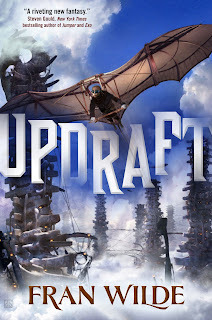 Fran Wilde’s first novel, Updraft, debuts from Tor Books on September 1, 2015. Her short stories have appeared at Tor.com, Beneath Ceaseless Skies, Uncanny Magazine, and in Asimov’s andNature. Fran also interviews authors about food in fiction at Cooking the Books, and blogs for GeekMom and SFSignal. You can find Fran at her website, Twitter, and Facebook.